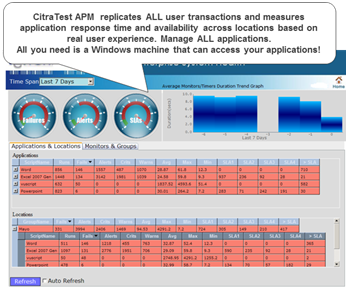 Easily Measure Response Time, Availability and User SLAs for ALL Applications with CitraTest APM! Your applications are the backbone of your business. From fueling day-to-day sales and business operations, supporting employees and partners, delivering revenue-generating services or showcasing information on the Web, your application must out-perform, or your customers will abandon you in favor of your competition or flood your helpdesk with open issues and escalations. Yet with users demanding consistent availability and faster experiences, hundreds of heterogeneous applications to support, and complex architectures spanning across locations, datacenters, private, public or hybrid clouds, ensuring optimal application performance has never been so challenging for IT professionals. Would you like to eliminate monitoring complexity, increase IT efficiency, and ensure user satisfaction by using just one solution? Proactively Monitor ALL applications with CitraTest® APM! Complete monitoring with ONE license: Set-up and configure one solution to monitor all your applications (Java, .NET, Citrix, Salesforce, Cassandra, SAP, Epic, Cerner, Terminal-based, legacy applications, etc.). Proactive user-centric monitoring: CitraTest® APM periodically executes synthetic transactions, taking response time measurements along the way. By automating the driving of any application just like a real user would do visually examining the desktop and responding to changes, driving the keyboard and mouse-- CitraTest® APM ensures that your application are available and working effectively, alerting you at the first sign of trouble. Get value and results in minutes: Easily monitor all user actions (clicking on, typing, comparing, awaiting display images…) with no effort, via an intuitive point-and-click scripting wizard. See exactly what the user sees. CitraTest® APM recognizes, evaluates and measures response time relying on powerful and proprietary image recognition technology; screenshots are also taken when problems are detected to help you analyze root cause. Measure and validate user SLAs: Build custom monitoring scenarios based on physical locations (Headquarters, NYC, remote offices, etc. ), monitoring functionality (SAP, Salesforce, Website, etc.) or a series of steps(e.g. logging, browse catalog, enter credit card, purchase). Anything can be measured in absolute values, percentages or statistical deviations. Streamline incident response procedures. CitraTest® APM integrates with all the enterprise management frameworks you already own today. Non-intrusive monitoring: Absolutely no elements of CitraTest® APM are installed on any server, plus no application code is ever modified, so you get complete non-intrusive monitoring that will not impact production operations. Ready to simplify monitoring, realize 3x-6x better value and results, and ensure optimal application performance and quality user experiences?